In the winter of 1777, Lady Martha Washington, at the behest of her husband, traveled from Virginia to spend time in Valley Forge and see her husband George. In the winter of 2015, the Lane family - Jerry, Gina, Caleb, Ava, Byron, and Grandma/Granddad Valerie and Gerald Zimmerman - made the same trip for the same reason. The Lanes were the weekend guests of the Valley Forge Tourism & Convention Board (VFTCB), invited after the YouTube video of five-year-old Ava went viral. Ava&apos;s tearful reaction to the news that her hero, General Washington, had long ago passed away spurred the tourism organization into action, as detailed in our blog from last week. The visit was full of surprises and a few tactical shifts owing to weather, but the result was undeniable. "We can&apos;t thank you enough," says Gina Lane, Ava&apos;s mother, as the family departed from its hotel, the Hyatt Place - Philadelphia/King of Prussia, to return home. Grandma Val says: "Ava will remember this weekend for the rest of her life... and if she doesn&apos;t, I will!" The Lanes&apos; Valley Forge Weekend began with their early-morning departure from Goode, Va. The 5.5-hour trip was uneventful, even when Granddad Gerald struggled with the signage for Conshohocken. "I told him that if he couldn&apos;t pronounce it, that he was officially fired as my navigator," laughed Jerry. With Saturday being their travel day, the family spent some hotel time just unwinding from the journey. By late afternoon, however, kids Caleb, Ava and Byron were ready for action. 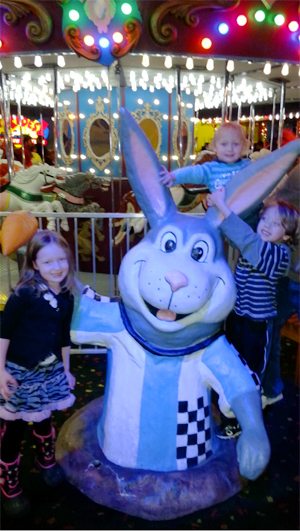 The family drove to Arnold&apos;s Family Fun Center, where they took full advantage of the indoor rides, games and bistro to enjoy themselves without concern for the bitter temperatures outside. On Sunday, their day of exploration began at Valley Forge National Historical Park. The wind chills may have been daunting, but the Visitor Center was warm and engaging, and Ava and her siblings spent time poring over the artifacts in the museum. The Lane family was the first to experience the VFTCB&apos;s Patriot Trails, a series of itineraries designed to encompass all the rich Colonial history throughout Montgomery County. The backstory on Patriot Trails is here. Following the full-day exploration, the Lanes left Valley Forge and ate lunch at the Black Powder Tavern. Ava&apos;s eye sparkled at the irony that the server&apos;s name was George. Fully energized by their meal, the family trekked to Lansdale for an afternoon visit to Peter Wentz Farmstead. There, Ava got to see the actual bedroom where General Washington not only slept but also planned military strategy. A big hit was the summer kitchen, where the kids learned of his ongoing affinity for "butter pie," a meatless English dish made of onions and potatoes. Caleb ended the day with an impromptu snowball fight; the powdery accumulation did not yield the best ammunition, but he seemed not to care much. Sunday evening, while the north winds howled, the family snuggled into their hotel room, ordering dinner from Famous George&apos;s Pizzaria. Where else would a Washington fan eat? Monday. Presidents&apos; Day. The big moment. The Lane family returned to Valley Forge, whose Visitor Center was already buzzing with members of the public. Ava and Caleb signed up for the Continental Army, happily showing that, as required, they possessed both sets of upper and lower teeth. 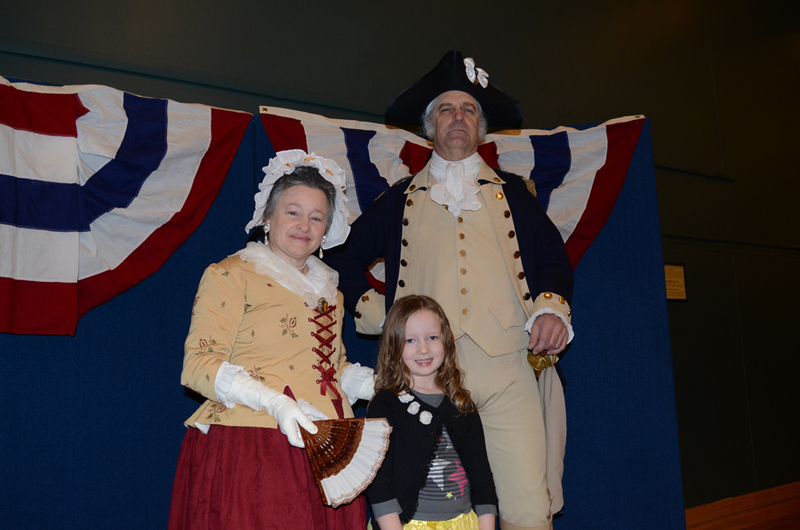 From there, Ava lined up to meet her hero, General George Washington. Eyes big as saucers, she approached her hero, who leaned down to greet her warmly. Martha Washington gave a big hug and reminisced about her own time in Ava&apos;s home state of Virginia. The Lanes then made cards for General Washington. They fashioned tricorne hats as instructed and decorated them with cockades. By then, it was party time. As the crowd pressed in, Ava was chosen to lead General Washington to the stage, a duty she fulfilled with expertise ... and a little hesitancy, owing to the vastness of the attendees. The massive cake, courtesy of the Culinary Arts Institute at Montgomery County Community College, was sliced with a sword, and Ava was given a sliver to sample. The crowd responded with a rousing chorus of "Happy Birthday" and a number of enthusiastic Huzzahs! After a quick lesson in Continental soldiering, the party was over. Bundled against the elements, the Lanes returned to their hotel for their final night. Dinner was at the nearby Maggiano&apos;s Little Italy, where the large portion sizes were perfect for a hungry brood. Tuesday morning, the overnight snowfall had cleared enough to make highway travel safe, and the Lane family piled into their van one more time and pointed the steering wheel homeward. As they said farewell and expressed their deepest thanks for the trip, they promised to come back. Ed Harris, VFTCB Vice President, summed up the welcome of Ava Lane and her family by saying: "At its core, this is what tourism does. This is our sweet spot. We connect visitors with experiences. It&apos;s all about reaching down to the individual level and ensuring that visitors to Montgomery County have the best time possible. "If they want to meet George Washington, we help them do that. If they want a plush hotel, we help them find it. If they want a night of unique dining, a day on the ski slopes, a chance to feed a giraffe, an amazing art gallery a happening concert. Whatever it is, we can find it and set them up for an unforgettable time." For your own unforgettable time in Montgomery County, check out the winter packages on our website. And collect your memories through use of #MakeItMontco.